Are you ready for your once-in-a-lifetime safari? 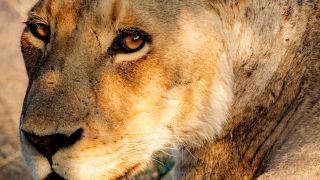 From photographing the Big Five – that's lion, leopard, rhinoceros elephant, and Cape buffalo – to the equally fabulous cheetah, zebra and hippopotamus, venturing into rural Africa brings some environmental challenges that you’d do well to prepare for. Plenty of spare batteries and high-capacity SD cards aside, when you’re after that killer photo of Africa’s apex predators, you'd better be on your game. Here's what you need to know. What's the best kind of lens for safari trips? Do you need a zoom lens on a safari? If you don't want to miss out on an opportunity of a lifetime, absolutely. The focal length you're going to need if you want close-up photographs is something in the 300mm region (or the equivalent if you're not using a full-frame system). Many professionals will use much longer lenses, but something that can reach 300mm provides a good balance between suitability, affordability and practicality. Besides, a good safari guide will get you surprisingly close to your targets, particularly in private game reserves. You do still need significant magnification in national parks because they often restrict or exclude off-road driving. If you're planning to take photographs of birds, such as fish-eagles, Kingfishers and owls, then all of this is moot; the longer your zoom lens, the better. Do I need a wide-angle lens for safari? Your priority is likely to be a close-up shot of one of the big five, and that's understandable, but don't forget that some animals comes very close, and also that you'll be travelling through some wonderful natural environments. From the Ngorongoro crater in Tanzania to Kenya's Maasai Mara, the Okavango Delta in Botswana and Namibia’s rugged Damaraland, where there is big game there are always big opportunities for dramatic landscape photography. So pack a reasonably wide-angle lens as well as a zoom lens, which will allow you to capture both animals and big landscapes. If you’re really tight on space, consider packing a compact camera or a pocket-sized action camera for wide-angle snapshots. Should I pack a tripod? What kind of landscape or nature photographer leaves home without a tripod? Although you should definitely take some kind of support with you, it's unlikely you'll use it very much while out in national parks and game reserves because you're likely to be inside a vehicle most of the time. Does that sound restrictive? In lots of ways it is. Drivers are often busy plotting where to go next, and how to extract their vehicle from a traffic jam, and setting one up inside a vehicle is either impossible or just impractical. So, instead of packing a regular tripod, consider taking a malleable tripod like the Joby GorillaPod SLR-Zoom or Shoot Flexible Sponge Tripod Stand for DSLR, which you can attach to the safety bars along safari vehicles, or at least use them to stabilise your camera. A monopod may also be used where a tripod wouldn't be realistic. Also pack a wired or wireless camera remote shutter release, which you can use to help you reduce judder and camera shake when taking shots with the zoom full extended. Every little helps. What about a bean-bag support? On a guided safari you won't be let out of the vehicle at any time. So arguably more useful than a tripod is a basic bean-bag support. These can travel with you completely empty; all you have to do is find some rice, or sand, and it becomes a handy support for your camera's long lens. These are practical for general wildlife photography, but if you're on a self-drive safari, getting out of your car is not only potentially dangerous, but also counterproductive because animals will notice you immediately and scarper. Instead, treat your car like bird hide by winding down the window and rest your lens on a U-shaped bean-bag like the Stealth Gear Ultimate Freedom Double Fox or the Grappler, which both hook over a car door. A more lo-fi approach is to turn your wound-down window into a safe-zone for your camera by adapting a simple swimming pool noodle to fit over it. If you’ve got a few walking safaris planned, consider a harness or sling like the Joby UltraFit Sling Strap or Lowepro Topload Chest Harness, which can make a quick-draw easier. Dust and sand gets everywhere when you're on a safari, and that can spell trouble for your camera. It depends on exactly where you're going, of course, but expect that your camera will get filthy every day. Firstly, get some protective filters for your lenses (as well as some polarising filters). You can then protect your camera bodies from both dust and from bashed or dropped by using something like the easyCover, a silicone rubber case that includes an LCD screen cover, and which is available for most models of DSLR camera. Just as important is to use a camera bag you know well and have used many times before; there's nothing more annoying that grabbling a new camera bag only for your camera to fall out because you've forgotten to zip it up properly. Of course, your camera is most at risk when you're changing lenses. The best advice is not to change lenses in dusty or sandy locations, which will limit how much dust and grime gets on your camera's sensor. However, that could mean bringing two bodies, which may not be practical. However, even when you're back at camp or in your safari tent, a simple air-blower like the Giottos GTAA1900 Rocket Air Blower or Ultra-Power Hurricane Air Blower is really useful for making sure your camera is dust-free before swapping lenses. Lastly, make sure you had double protection for your memory cards; something like the Beeway or Kupton K020 cases make sense. This might seem like a strange thing to think about when you're on a photography trip, but what you wear can drastically affect what kind of photographs you get. Neutral colours are always better than anything remotely brightly coloured. Anything that makes you stand out from the background will make you easily noticeable by wild animals, who will likely either back away or run away very quickly. That's no good for close-up photography; the answer is to wear something in safari-favourite khaki, though olive-green, grey or brown works just as well. There are a few other clothing considerations to take into account. You're likely to be sitting on the back of an open vehicle in early morning, which can be quite cold, at least for an hour or two. So bring a beanie hat, a light jacket or hoodie, and a scarf or Buff to keep warm. Something you can stash in your camera bag is perfect. Either way, long sleeve shirts and trousers are essential in the bush, where mosquitoes and biting tsetse are a constant nuisance. Hiking boots and a wide-brimmed hat are also advisable. Be very careful about hard-sided luggage. It's likely that you keep a soft camera bag near you, but don't be tempted to take rolling luggage without first checking your itinerary. If you'll be traveling in light aircraft, expect there to be tight restrictions on weight. For photographers, that can be tricky, but packing your clothes and non-photographic gear in a duffel bags is a wise move. Firstly, know the rules and restrictions on all of your flights – including scenic flights – before you leave home. Secondly, know exactly what you have by using something like the Beurer Travelmeister LS-50, a digital luggage scale that also has an integrated LED torch and 5,000mAh portable charger. That may sound like a lot to pack, but don't overdo the non-essentials. Going on a safari is often about extracting as much as you can from a well-planned and well-packed camera bag.